Luca Guadagnino’s films are all about the transformative power of nature—the way it allows our true selves to shine through and inspires us to pursue our hidden passions. From the wild, windswept hills of “I Am Love” to the chic swimming pool of “A Bigger Splash,” Guadagnino vividly portrays the outside world as almost a character in itself—driving the storyline, urging the other characters to be bold, inviting us to feel as if we, too, are a part of this intoxicating atmosphere. Never has this been more true than in “Call Me By Your Name,” a lush and vibrant masterpiece about first love set amid the warm, sunny skies, gentle breezes and charming, tree-lined roads of northern Italy. Guadagnino takes his time establishing this place and the players within it. He’s patient in his pacing, and you must be, as well. But really, what’s the rush? It’s the summer of 1983, and there’s nothing to do but read, play piano, ponder classic art and pluck peaches and apricots from the abundant fruit trees. 17-year-old Elio (Timothee Chalamet) is once again visiting his family’s summer home with his parents: his father (Michael Stuhlbarg), an esteemed professor of Greco-Roman culture, and his mother (Amira Casar), a translator and gracious hostess. Elio has the gangly body of a boy but with an intellect and a quick wit beyond his years, and the worldliness his parents have fostered within him at least allows him to affect the façade of sophistication. But beneath the bravado, a gawky and self-conscious kid sometimes still emerges. By the end of the summer, that kid will be vanquished forever. Writer James Ivory’s generous, sensitive adaptation of Andre Aciman’s novel reveals these characters and their ever-evolving dynamic in beautifully steady yet detailed fashion. And so when Elio and Oliver finally dare to reveal their true feelings for each other—a full hour into the film—the moment makes you hold your breath with its intimate power, and the emotions feel completely authentic and earned. 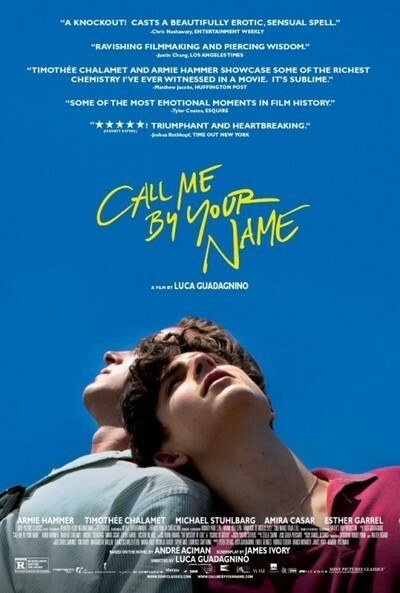 And yet, the most resonant part of “Call Me By Your Name” may not even be the romance itself, but rather the lingering sensation that it can’t last, which Guadagnino evokes through long takes and expert use of silence. A feeling of melancholy tinges everything, from the choice of a particular shirt to the taste of a perfectly ripe peach. And oh my, that peach scene—Guadagnino was wise when he took a chance and left it in from the novel. It really works, and it’s perhaps the ultimate example of how masterfully the director manipulates and enlivens all of our senses. They know what they’ve found has to end—we know it has to end. But a beautiful monologue from the always excellent Stuhlbarg as Elio’s warmhearted and open-minded father softens the blow somewhat. It’s a perfectly calibrated scene in a film full of them, and it’s one of a million reasons why “Call Me By Your Name” is far and away the best movie of the year.